Remove the leaves from the stems of the thyme and mix together with the garlic and olive oil. Thread the pork and vegetable chunks onto 4 large barbecue skewers. 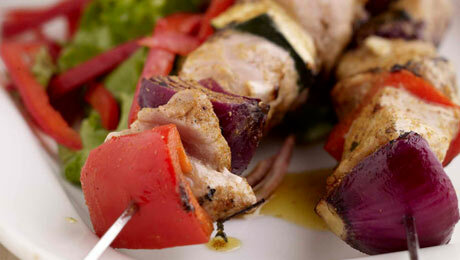 Arrange the skewers in a baking dish, drizzle with the marinade and marinate for 30-40 minutes. Preheat the barbecue and cook the skewers on each side for 3-4 minutes until cooked. I normally cover the barbecue with the lid to allow the meat to cook thoroughly. Place the baby potatoes in a pot of cold water and bring to the boil. Cook until just tender. Strain off the water and slice the potatoes into chunks. Meanwhile sauté the thinly sliced red onion and garlic until softened, add in the sliced potatoes and mix well until the potatoes are golden brown. Season lightly with salt and pepper and then serve immediately with the pork skewers. If you are using wooden skewers make sure to soak them in cold water overnight to prevent them from burning. It is vitally important to cook pork thoroughly. Hi Jayne, it's 2 x 130g pork chops. Let us know how you get on!